Listen now as Oscar Barrera teaches us to "see reality" as anthropologists do! Oscar Barerra has a great story to share and a lot of lessons for all of us to learn. As with many of us, Oscar was not really sure what type of career he wanted to pursue. He did know that he had a knack for seeing things with fresh eyes and turning his ideas into insights for business executives. 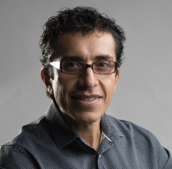 From rural Mexican highlands to urban shopping malls, Oscar has worked in a variety of industries, all the while helping business leaders better adapt to new technologies. Listen in! Born in Mexico City, Oscar Barrera is a passionate Ph.D. anthropologist who never thought of becoming one. His journey started when he met anthropologists in the Chiapas Highlands of Mexico after finishing his coursework for his bachelor’s degree in Tourism Studies. Fascinated by the unique ways anthropologists understand and see things, Oscar decided to become one in order to "see reality" as anthropologists do. Having worked in 24 countries around the world, Oscar is currently CEO of his own business, Appamada Consulting, which is devoted to helping businesses change, grow and innovate using anthropological tools and methods. Today, Oscar's anthropological work spans many industries. He has consulted with coffee farmers in the highlands of Mexico to help them better adapt to new technologies and farming methods being implemented by the farms' owners. He has also worked in shopping malls to help business owners better engage with employees. Whatever the setting, Oscar loves finding new opportunities to creatively apply anthropological methods to challenging situations demanding innovative solutions, in Mexico and the U.S. He is based in the city of Veracruz, located on the Gulf of Mexico Coast in eastern Mexico. The great potential of anthropology to change the way we see and do things in the business world.